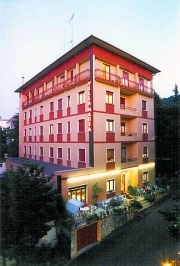 Hotel Villa Maria is located in the heart of Chianciano Terme, within a short walk from all the main facilities and attractions. The hotel is characterised by its strategic position, in a quiet private road close to the heart of the town and most important shopping area, just a few steps away from the main SPA "ACQUASANTA", FUCOLI Park, the new and unique in Italy Wellness Center "TERME SENSORIALI", PALAMONTEPASCHI (Bruco/Caterpillar), futuristic structure for dancing, exhibitions and events in general. The Hotel which has newly renovated has 47 rooms all with en-suite bathroom and equipped with air-dryer, direct-deal telephone, tv colour, safety deposit box, central heating and ceiling fan; some of them with balcony. The Hotel is personally run by owners. Special attention is paied to the cuisine which is mainly from this area, with a daily choice of double menu; on request, special light meals for children and people with dietary requirements or health problems; we serve continental breakfast, but a buffet is arranged to give our Customers a large choice of food. Lift, private free parking (coaches allowed), air conditioning in public areas (restaurant and reception), bar, fax, tourist information and help desk, multilingual staff, for children: baby cots, highchair, feeding – bottle warmer, light meals, mini bar, baby sitting. Motorway A1 "Autostrada del Sole", Rome-Florence exit Chiusi-Chianciano Terme 7 Km from the Hotel.